While we were waiting outside the university theater, questions popped inside my head, why were we there, why do I have to be here? Why is it taking so long? Was I the only one feeling this way? Most would answer that we were celebrating the achievement of finishing a degree program. It’s a graduation. It’s a thing to be celebrated. It’s the norm. After all the hardship of going through the motions of attending class, answering exams, presenting cases, defending papers and what have you; surely it deserves recognition and celebration. Finally, we were asked to go inside the theater. A mass of flashes and twinkling lights greeted us as we walked inside the theater. Among the sea of faces, I could see a lot of them were smiling and looking excited. It was strange for me, and awkward too since I do not like being in the spotlight as I prefer to exist behind the scenes. We walked towards our seats, all the while smiling and posing for the cameras. The program went on, and the speakers reminded us the lessons of appreciation and dreaming. They reminded us first to take note of all the things that you have, may it be small or big. Often times we take for granted the simple things that other would wish for, like the ability to write, to speak, and even to live. He had a point. Most people do have a bad habit of having tunnel visions and turning to God only in times of hardship. True. They finally reminded us of what having a dream means, and what it takes to make it a reality. Dreams don’t come true overnight. They become reality through hard work, prayer, and cooperation. To be fair, these lessons should have been imbibed already and they are pretty cliche. Cliche but true. After the speakers, we were finally invited to the stage for our ten-second moment of “glory” which would most probably (in my opinion) be remembered more by those who were watching than the ones who were walking. Shaking hands with the officials who gave the medal and the certificate, I wondered whether they were sincere with their smiles and words and why. With a light medal on my chest and a framed certificate in my hand, I began thinking what was the point to all of this. I did not really feel anything with receiving what I had at first. I felt blank. I just merely accepted it. What was it for? Certainly not for me. They were just objects to me. But then I realized, that it’s not for me. The graduation, the medal, the certificate, no. It’s not for me. It’s not for me. This is for those who lent me their strength and supported me to face whatever trials I had; this is for those who believed in me when I couldn’t. It’s not for me because this is me. This is what I achieved through the help of many people. 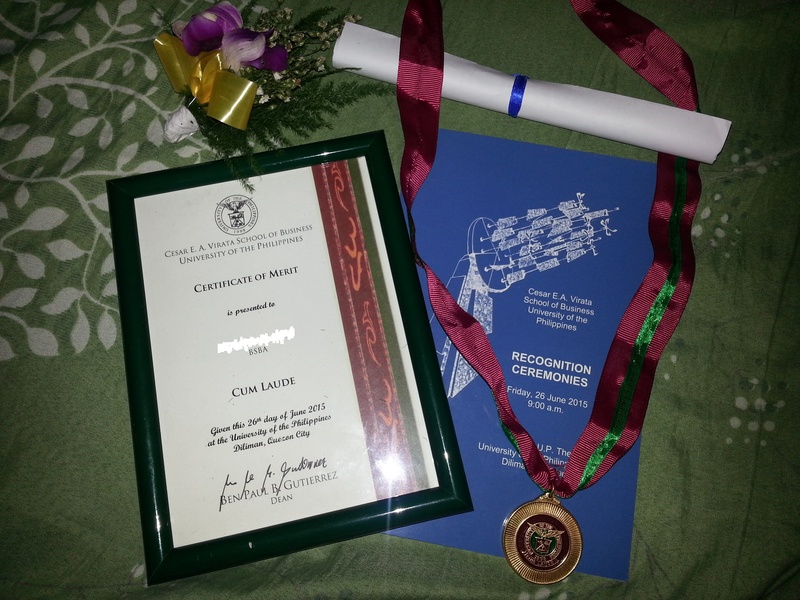 This is the result of the endless nights of cramming and crying, of worrying and thinking, of studying and learning. This is the result of fighting hard my doubts, worries, fears and regrets. It’s for my teachers in grade school and high school who taught me the basics, who taught me the results of hard work and who taught me valuable lessons of perseverance and determination. Effort and Faith. It’s for my professors in college who did their best to remind us students what it means to be a scholar of the nation, who did their best to equip us with skills to survive the harsh world out there, who did their best to teach us abilities to solve whatever problems we may have, not only for ourselves but most importantly for the benefit of the society and who reminded us to do our best wherever we may be. Honor and Excellence. It’s for my high school friends who made me see the bright side, who made me feel happy just by being there, who reminded me to socialize and not to drown in my academics, and who reminded me of what I did, who I was and who I could still be. It’s not for me, this is for them. It’s for my college friends, classmates and orgmates who made me see possibilities, who taught me how to face challenges, who made me have confidence in my skills and abilities, who reminded me that things cannot be achieved alone. It’s not for me, this is for you. It’s for my true friend who tried her best to be there always for me, even if I couldn’t be there for her always, even if I had taken her for granted at sometime. This is for you who reminded me of what I am, who forced me to think outside the box, who taught me how to be resolute in decisions, who helped me in a lot of things and helped me by simply being there. This is for you, even though I know you already have your own (haha). It’s not for me, this is for her. It’s for my childhood best friend who have always supported me, who taught me how to be strong and to keep going on, who reminded me to move on from my mistakes and appreciate what I did. This is for you, when you kept me sane throughout the college years even if we were not always together, even if you didn’t know. This is for you, even though I know you might be raising your eyebrows right now and wondering what you might do with metaphorical objects. Just accept it dude. It’s not for me, this is for her. It’s for my parents who were always there for me through thick and thin, who reminded me that I do not have to carry my burdens alone, who loved me and still loves me even with my weaknesses and shortcomings, who worked hard to raise my siblings and I properly, who did their best that I may be guided rightly, who supported my decisions and taught me responsibility. Ma, Pa, para sa inyo po ‘to. It’s for the society, who paid for the cost of our education, who is still waiting for us students to achieve what we can in order to help them. Para sa bayan, para sa bansa. It’s for God who is always, always, always there for me, who guided me and showed me the light when I was lost in the dark, who gave me life and gave me second chances when I failed so badly, who reminded me of the important things in life. It’s not for me, this is for God. Alhamdulillah (Praise be to Allah). It’s not for me. This is for my hard work, my laziness, my strengths and my weaknesses. This is the result of a battle, with my friends and family as comrades, and God as my commander. This entry was tagged dedication, graduation, life, UP. Bookmark the permalink.